Deeply ashamed, Joachim left the city. In the desert he pitched a tent, saying, “I shall fast and do penance until the Lord deems me worthy.” He went into the desert and fasted for 40 days and nights. Anna wept to see her husband go. Anna gave birth to a beautiful baby girl, in gratitude to the Lord, Joachim vowed that once the child turned three years old, she would be sent to the Temple to be educated. When she was six months old her mother stood her on the ground to see if she could stand. Walking seven steps, she came to her mother’s bosom. Anna held the baby to her and said, “As the Lord is my God, and He has sent me a miraculous child.” Anna then caught her up, saying “as the Lord my God lives, you shall not walk on this earth again until I bring you to the Temple of the Lord”. Then she made a sanctuary in her bedroom and prohibited everything common and unclean from passing through it. When the child was three years old, Joachim said, “let us call the undefiled daughters of the Hebrews and let each one take a torch and let them be burning in order that the child not turn back and her heart be misled out of the Temple of the Lord”. Thus they did, until they had gone up into the Temple. The priest received her, and kissing her he blessed her and said, “The Lord God has magnified your name in all generations, in you at the end of todays will the Lord God manifest his deliverance to the children of Israel”. He set her on the third step of the alter, and the Lord God gave grace to her, and she danced with her feet, and all the house of Israel loved her. At last it was time for Mary to climb the steps to the Temple. A halo of light encircled the blessed child and filled with joy, she began to dance. The child’s bright spirit could not be contained anymore than the sun can be kept from rising. Her parents returned marvelling and giving praise and glorifying the Lord God that the child did not turn back. One day Zaccharia, the chief priest overseeing Mary’s education was discussing the scriptures with a small group of holy men. The child sat beside him, for already she was a great favourite with these revered elders. “The Lord made us to serve Him,” Zaccharia declared. “And to glory in His kindness,” said Mary softly. Startled, the old priest looked at her. “The little one is fearless and yet all gentleness,” he told himself as the others exchanged smiles. When her chores were done, in the remaining hours of each day she went out alone just beyond the gates of the Temple. There she would distribute food and clothing to the poor and the elderly who came hoping for charity. In time the other girls followed her example, and the Temple became known far and wide for its generosity. That day the marriage contract was signed, and in twelve months the wedding ceremony would be celebrated. In the meantime, Mary returned to her parents while Joseph departed for a distant town where he was about to begin work on the building of a Temple. The commission was a great honour, but it would separate the couple for nearly a year. “But how can such a thing be possible? I am not yet wed,” said Mary. “The Holy Spirit will pass through you as a ray of sunlight passes through a drop of water, and so the child will be called the Son of God.” Mary shook her head in wonder. Bowing before her, the angel Gabriel Kissed the hem of Mary’s robe and then vanished. Alone, Mary wondered what kind of destiny she had carved for herself. How was she to explain this to her parents? And to Joseph? On the way to Bethlehem where they were going to be ‘enrolled’, Mary came down from her donkey, knowing that her time had come. Joseph took her into a cave and while the heavens stood still and the birds of heaven rested, while time itself throughout nature and humanity came to a stop, there, Mary gave birth to Jesus. A great light appeared in the cave as the baby was born. For a moment he was pure light, then as the light faded a child appeared. Although Mary is not described in any detail she is referred to as an innocent child – her situation is compelling and wondrous. The very delicate treatment of the figure of Mary has contributed to her warm and mysterious presence in later Mariology. Early manuscripts of the Gospel of James exist in Greek, Syriac, Ethiopic and Georgian, reaffirming the significance of the role of Mary in the divine play. The reoccurring themes of purity, chastity, love and compassion dominate the life of Mary, indeed she is the embodiment of these qualities. The qualities of a Mother. But greater than any Mother born of this earth. She is the perfect example of how the feminine power of God manifests itself as a “Mother”, just as Christ is the perfect example of the power of God when embodied as a “son”. The most comprehensive stories about the early childhood of Mary are attributed to the Gospel of Luke and the Gospel of James. This has been documented by historians as being written prior to the year 200 AD. The qualities of mercy, compassion, comforting and counselling have long since been seen as feminine qualities, all of which Mary emanated. They are also the qualities of the future incarnation promised by Christ, “But the Comforter, which is the Holy Ghost, whom the Father will send in my name, shall teach you all things” (John 14:26) Could it be that he was telling then of the age of the Mother, when the feminine power of God would grace this earth. If God Almighty deemed Her pure enough to bear his Son, then it could be suggested that She has a special place in the Holy Trinity. We talk much of the Father, the Son and the Holy Ghost. We have this trinity in the birth of Christ – God the Father, Christ the Son and Mary the Mother. This begs the question: “Is the Holy Ghost a feminine power, a mothering power that came on this earth to bear the Son of God and teach mankind of the mercy and love of God?”. According to tradition Mary has been called upon as the Mother of Mercy since the 3rd century. James describes the day Mary is presented to the temple by her parents Anna and Joachim. “When the day arrived, the undefiled daughters of the Hebrews were invited to accompany Mary with their lamps burning to the Temple. There the priest received her, blessed her and kissed her in welcome”. He proclaimed, “The Lord has magnified thy name in all generations. In thee, the Lord will manifest His redemption to the sons of Israel.” Mary was placed on the third step of the Temple and there danced with joy and all the house of Israel loved her. Without looking back, Mary climbed the stairs of the temple. It was there that she was nurtured and her parents returned glorifying the Almighty. This shows that even in her childhood Mary was completely dedicated to God. It is from this very account that arose the feast of Mary’s Presentation. We know that in the Byzantine Church this feast is considered one of the twelve great feasts of the liturgical year, called the Dodecaorton. Scholars believe that Mary’s Presentation in the Temple is considered a major feast for the Eastern churches celebrating the same values that the Western church celebrates in the feast of the Immaculate Conception. The Gospels give only a fragmentary account of Mary’s life, mentioning her chiefly in connection with the beginning and the end of Jesus’ life. Matthew speaks of Mary as Joseph’s wife, who was “with child of the Holy Spirit” before they “came together” as husband and wife (Matthew 1:18). After the birth of Jesus, she was present at the visit of the Magi (Matthew 2:11), fled with Joseph to Egypt (Matthew 2:14), and returned to Nazareth (Matthew 2:23). Mark simply refers to Jesus as the son of Mary (Mark 6:3). The Gospel of John contains no infancy narrative, nor does it mention Mary’s name; she is referred to as “the mother of Jesus” (John 2:1-5; 19:25-27). According to John, she was present at the first of Jesus’ miracles at the marriage at Cana in Galilee, although her name is not used (John 2:1); the attempt to see Jesus while he was teaching (Mark 3:31); and the station at the cross, where, apparently widowed, she was entrusted to the disciple John (John 19:26). Even if one takes these scenes as literal historical accounts, they do not add up to an integrated portrait of Mary. The Gospel of Luke and the Acts however give us the essential framework for the beginning of an authentic study of Mary. The first mention of Mary is in the story of the Annunciation, which reports that she was living in Nazareth and was betrothed to Joseph (Luke 1:26); the last mention of her (Acts 1:14) includes her in the company of those who devoted themselves to prayer after the ascension of Jesus into heaven. She appears in the following incidents in the Gospels: the Annunciation; the visit with Elizabeth, her kinswoman and the mother of John the Baptist, the precursor of Jesus (Luke 1:39); the birth of Jesus and the presentation of him in the Temple (Luke 2:1); the Passover visit to Jerusalem when Jesus was 12 years old (Luke 2:41). She continued to be at all the key events in his life, even at his death and when Jesus’ promise of his Spirit was given at Pentecost There is no one person who ever had such a close relationship with Jesus in all of these stages of his life. Her role, quietly in the background gave support and encouragement to the work of Jesus. 27- to a virgin engaged to a man whose name was Joseph, of the house of David. The virgin’s name was Mary. 29- But she was much perplexed by his words and pondered what sort of greeting this might be. 30- The angel said to her, “Do not be afraid, Mary, for you have found favor with God. 31- And now, you will conceive in your womb and bear a son, and you will name him Jesus. 32- He will be great, and will be called the Son of the Most High, and the Lord God will give to him the throne of his ancestor David. 35- The angel said to her, “The Holy Spirit will come upon you, and the power of the Most High will overshadow you; therefore, the child to be born will be holy; he will be called Son of God. 36- And now, your relative Elizabeth in her old age has also conceived a son; and this is the sixth month for her who is said to be barren. 38- Then Mary said, “Here am I, the servant of the Lord; let it be with me according to your word.” Then the angel departed from her. 1- In those days a decree went out from Emperor Augustus that all the world should be registered. 2- This was the first registration and was taken while Quirinius was governor of Syria. 3- All went to their own towns to be registered. 4- Joseph also went from the town of Nazareth in Galilee to Judaea, to the city of David called Bethlehem, because he was descended from the house and family of David. 5- He went to be registered with Mary to whom he was engaged and who was expecting a child. 6- While they were there, the time came for her to deliver her child. 7- And she gave birth to her firstborn son and wrapped him in bands of cloth, and laid him in a manger, because there was no place for him in the inn. This is a very well known account, but what of the conception and birth of Mary? Her entry into this world is no less miraculous and her childhood equally reflects the power and presence of the divine all pervading power of God Almighty. According the traditions of the Orthodox and Catholic Church, the Blessed Virgin Mary having completed the course of her earthly life, was assumed body and soul into heavenly glory. This means that Mary was transported into Heaven with her body and soul united. The feast day recognizing Mary's passage into Heaven is celebrated as The Feast of the Assumption of the Blessed Virgin Mary. Despite its recent definition as dogma, the story of the assumption dates back to the early centuries of the church. The earliest narrative is the so-called Liber Requiei Mariae (The Book of Mary's Repose), a narrative which survives intact only in an Ethiopic translation Probably composed by the fourth century, this early Christian apocryphal narrative may be as early as the third century. Also quite early are the very different traditions of the "Six Books" Dormition narratives. The earliest versions of this apocryphon are preserved by several Syriac manuscripts of the fifth and sixth centuries, although the text itself probably belongs to the fourth century. This mystery is celebrated on August 15. Later apocrypha based on these earlier texts include the De Obitu S. Dominae, attributed to St. John, a work probably from around the turn of the sixth century that is a summary of the "Six Books" narrative. The story also appears in De Transitu Virginis, a late fifth-century work ascribed to St. Melito of Sardis that presents a theologically redacted summary of the traditions in the Liber Requiei Mariae. An Armenian letter attributed to Dionysus the Areopagite also mentions the event, although this is a much later work, written sometime after the sixth century. Other saints also describe it, notably St. Gregory of Tours, St. John Damascene, and St. Modestus of Jerusalem. In some versions of the story the event is said to have taken place in Ephesus, in House of the Virgin Mary, although this is a much more recent and localized tradition. The earliest traditions all locate the end of Mary's life in Jerusalem . By the seventh century a variation emerged, according to which one of the apostles, often identified as St. Thomas, was not present at the death of Mary, but his late arrival precipitates a reopening of Mary's tomb, which is found to be empty except for her grave clothes. In a later tradition, Mary drops her girdle down to the apostle from heaven as testament to the event This incident is depicted in many later paintings of the Assumption. The story of the Assumption was generally accepted as fact in medieval Christianity, as a corollary to the theological assertion of Mary's Immaculate Conception. Theological debate about the assumption continued until 1950 when it was defined as doctrine. Coronation of Mary as Queen of the Heavens by her son, Jesus Christ, during the Assumption of Mary, is a tradition known since the 12th century. Queen of Heaven (Latin Regina Cæli) is one of a number of titles used particularly for Mary, the mother of Jesus. The title is with reference to the end of her earthly life when Mary was bodily assumed into heaven. There she is honoured as Queen, for the sake of her Son. From her throne, Our Mother dispenses love and peace to men. According to apocryphal writings, Mary spent her childhood from age 3 – 12 in the temple. The medieval representation of this shows Mary wearing a sash whose both ends are knotted in such a way that they are hanging loose and low. 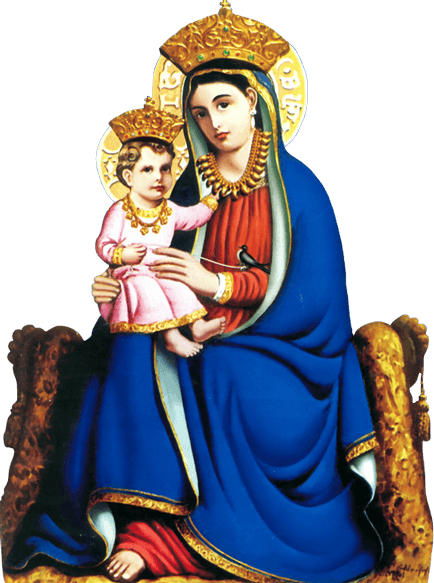 The sash is a typical attribute of the virgin in the temple and symbolises Mary’s chastity and virginal and exclusive dedication to God later on. The sash is also attributed to the Immaculate. To have knots in one’s garment keeps danger at bay. Knotting and untying are faculties of the divine (master of human destiny) and also of Christ (he freed himself from all earthly “attachments” and bonds). There are customs according to which the robes of the fiancés are knotted together to suggest a common destiny. This occurs in many eastern traditions where the bride and groom literally “tie the knot” during the marriage ceremony. His scarf is tied to the end or her gown (or sari). However, the most significant meaning of the sash is that of both virginity and motherhood combined, as a consequence of God himself tying and untying the knot of Mary’s dedication of herself to Him. Again the importance of chastity and purity is reaffirmed. It is quite evident that the Gospels of Luke and James give us good grounding for the beginnings of an in depth study of Mary and her true identity. As early as the 2nd century, Christians venerated Mary by calling her Mother of God. During the controversies of the 4th century concerning the divine and human natures of Jesus, the Greek title Theotókos (Mother of God) came to be used for Mary in devotional and theological writing. This suggests the divine nature of Mary and her true place within the Holy Trinity. Closely related to the title Mother of God is the title Virgin Mary, affirming the virginal conception of Jesus (Luke 1:35). God, not Joseph, was the true father of Jesus. In the Marian devotion that developed in the East in the 4th century, Mary was venerated not only in the conception but also in the birth of Jesus. This conviction was expressed clearly in the 4th century, baptismal creeds of Cyprus, Syria, Palestine, and Armenia. The title used was Aieiparthenos (ever-virgin), and by the middle of the 7th century the understanding of the title came to include the conviction that Mary remained a virgin for the whole of her life. This notion reinforces the idea that Mary was not touched by this world, indeed her purity of spirit, body and mind signaled her attachment to the realms of the Gods. The passages in the New Testament referring to the brothers of Jesus (for instance, Mark 6:3, which also mentions sisters; see 1 Corinthians 9:5; Galatians 1:19) have been accordingly explained as references to relatives of Jesus or to children of Joseph by a previous marriage. In the 2nd and 3rd centuries, various Christian writers began to express the belief that, because of her intimate union with God through the Holy Spirit in the conception of Jesus, Mary was completely free from any taint of sin. In 680AD a Roman Council spoke of her as the “blessed, immaculate ever-virgin.” This can be taken one step further it can be suggested that Mary completed the “Holy Trinity” not that she was touched by the Holy Spirit, but that she was the Holy Spirit. Who else could have born the Son of God on earth? Thus completing the Holy Trinity – God the Father, God the Son and God the Mother. During the late Middle Ages (13th century to 15th century), devotion to Mary grew dramatically. Mary came to be depicted as the one who interceded for sinners. As the fear of death and the Last Judgment intensified following the Black Plague in the 14th century, Mary was increasingly venerated in popular piety as mediator of the mercy of Christ. Her prayers and pleas were seen as the agency that tempered the stern justice of Christ. Indeed Christ had talked of the Comforter, Councillor and Redeemer who would come at the time of the Last Judgment. People turned to Mary for God’s compassion, recognising these as feminine qualities, the qualities of a Mother.